Jenny Stewart had waited decades to meet a Mountie in red serge and was thrilled when her wish came true earlier this year. What the 85-year-old didn't expect was the quiet friendship that has resulted from her encounter. "He's a Mountie and he's a busy man and I don't expect him to come and see me," she said of RCMP Const. Scott MacLeod. But the officer — who first came to meet Stewart at the request of staff who work in the Port Alberni, B.C., hospice where she lives — did come to visit her again, more than once. "He came to my birthday party, there were other people here but he came along and wished me a happy birthday," she recalled. "And then I saw him just recently at the Remembrance Day service and I spoke to him there, got a kiss on the cheek. He gave me a kiss on the cheek and said 'Don't tell my wife,'" she said with a chuckle. Since their first meeting, Stewart has also been introduced to MacLeod's wife and two sons, and the RCMP officer has met her brother. "He's a really nice fellow," Stewart said of MacLeod. "To meet a Mountie again after my first experience was terrific. I've always admired the Mounties." That admiration with the officers who have become a Canadian symbol first began when Stewart was a young girl living in her native Scotland. She remembers going on a school trip to the British Empire Exhibition in Glasgow as a 10-year-old girl and taking in the exhibit from Canada. "Standing at the top in red serge was the Mountie. And I was gone," Stewart said with a girlish giggle. "I don't know what it is, I've always just admired the Mounties. They're different, they're special, and they are definitely Canada." Years after catching her first glimpse of an RCMP officer, Stewart married a Canadian soldier and moved to Canada. The war bride and her husband lived in Saskatoon before moving to B.C. in 1958. Her husband died in the 1970s, leaving Stewart to raise four children as a young widow. 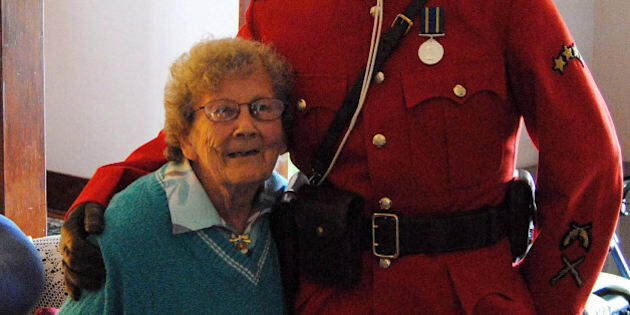 Through the years she continued to admire the Mounties from afar but only recently told staff at her hospice of a long-held wish to actually meet one face-to-face. A kitchen supervisor at the facility attended the same church as MacLeod and asked if he'd take the time to visit Stewart. He showed up in full formal uniform, and even let Stewart try on his hat. "When he came to visit me here at the house it was wonderful to talk to him," said Stewart. "We had tea and cookies, and just talked." The story of the encounter charmed Canadians across the country and turned Stewart into a minor celebrity for a moment. People from all over the world wrote to her after hearing her story and she even appeared on the BBC in Scotland. "It was a genuine surprise and then what followed with the different newspapers was exciting," she said. "It was wonderful."